A conservationist explores various global regions to investigate examples of environmental degradation and renewal while identifying a link between environmental dangers and human rights issues. 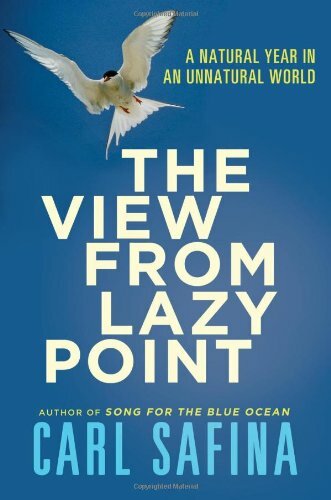 "Carl Safina’s ambitious new book, “The View From Lazy Point,” is a series of field reports entwined with a loving meditation on the interconnectedness of nature and humanity. The story he tells is “partly about a kind of heartbreak for a world that remains so vitally unaware of how imperiled it is.” But it’s also about how, despite the gloomy reports, “the world still sings.” Safina’s account of “a natural year in an unnatural world” can be harrowing, but its impassioned, informed urgency is also filled with hope, joy and love. " I really enjoy eco-writing and Carl Safina's message about the inter-connectedness of our world is relevant and interesting...none the worse the wear for having been brought up by other environmentalists. From his home on Long Island, New York, to the Caribbean, Svalbard in the North Atlantic, Palau in the South Pacific, and on around to Alaska, he drives home the point that making a major change in an environment results in other major changes. Often, these changes are ones that our habit of simplistic thinking doesn't anticipate. For example, you want more salmon...get rid of the bears that are eating the salmon, right? Well, no. Getting rid of the bears gets rid of them dragging huge quantities of fertilizer (in the form of salmon carcasses) into the woods, which gets rid of the trees, which gets rid of the streams salmon need, which gets rid of the salmon. The most interesting part of his message is not that we must stop leaving our footprint on the world. It's just that we have to learn moderation: moderation in population pressure, moderation in how much we take out of the environment, and moderation in how much we put into it. We need to stop being a nation/world of corporations and become a nation/world of individuals who are connected to what is around them. A View from Lazy Point stands out in the unfortunately crowded field of ecological-devestation books thanks to Safina's philosophical and even spiritual musings. The book follows a seasonal year, from the earliest signs of spring one February until the following January, as seen from Safina's home at "Lazy Point" near the tip of Long Island, New York. Safina is a trained ecologist with years of experience on the island, and brings both background and understanding to his observations; not only the baseline to know that horseshoe crab populations are down and Osprey numbers are up, but the understanding to know the reasons for those trends and what them imply in a larger context. The book sits neatly between the purely personal study of a particular area, with its rich sense of place, and a broader overview of the changes humans are bringing to our environment and our climate. He emphasizes interconnectedness throughout the book, both on a local scale (the effect of overfishing of horseshoe crabs on migratory shorebirds) and globally, through the subtle mention of Ruddy Turnstones nearly everywhere he travels, from Alaska to Palau. In between his thoughtful observations of the local environment, Safina travels to polar and tropical regions, to provide perspectives unavailable from the temperate region where he lives. Everywhere he goes the story is similar; ecosystems are in grave danger, from penguins to coral reefs. The scientists he meets with can do little more than monitor and quantify the decline in the species and systems they care about. The "hopefulness" mentioned in the blurb is limited to the conviction that we have not reached the point of no return; this is not a starry-eyed bit of optimism, but an affirmation that it isn't too late to do something. Carl Safina is the sort of knowledgeable naturalist that I generally find among my circle of friends. He would fit right in and probably enjoy our pot-luck dinners.This is to say I believe I share a large part of his worldview, which tries to be optimistic in the face of the natural world, but more often descends--if not into despair-- then into a deep cynicism that humans will ever get it together enough for things to get much better. Naturally, I try to keep this to myself and stay positive when I'm around the kids. But as I read this book, I got the feeling that Safina was also trying to stay upbeat around his editor. I'm sure he was getting a lot of comments like, "Geez, Carl, lighten up a bit or we will never sell any books!" Carl Safina has his fingers on the pulse of the planet. He has crisscrossed the globe in an effort to assess the health and success of a wide range of living things. Salmon, sea birds, whales, penguins, coral, bears, horseshoe crabs and more. His tellings of their feeding, mating, migration and lifespan are utterly poignant. He brings to life the hidden places of delicate beauty of the sky, sea and land. But seeping through these heartwarming accounts are glimpses of frustration and anger. Anger at strip malls, unthinking hunters, greedy corporations. Concern over global warming, overfishing, rampant development. He does believe there is hope -- he has been witness to isolated improvements in the health and wealth of some of earth's creatures -- but wants us to know it's not nearly enough. The Book Report: Carl Safina is an August Personage. He's a Guggenheim Fellow. He's a MacArthur Fellow. He's won at least two awards for literary merit in writing about science. He founded Blue Ocean Institute. He's been on the teevee, too! PBS, even Nightline! Here he chronicles the full twelve months of his year of environmental activism and study for our delectation and enlightenment. My Review: I am not delectated and not particularly enlightened, and if I didn't owe a review to the publisher, I'd just quietly pass this dull, overwritten snoozefest to someone who's never read Silent Spring and therefore has no basis for comparison re: quality advocacy writing with a personal touch. There are several messages in Safina's book. One is that there is still a lot to observe in nature even in this day and age. Look daily no matter where one lives and the unfolding natural world will reveal itself. Things aren't what they used to be but there is still an interesting amount of nature's resiliency in play. Safina covers coastal ecologies in The View From Lazy Point but nature can be observed in any locale. He tracks his neck of the woods, tip of Long Island, for a year and records his observations. He also makes trips to other areas across the globe during the year and reports on conditions in those far-flung places. It is balanced with good news and bad news points of view. Interspersed with the nature writing is some philosophical musings, some economic rambling (his economic thoughts are best described as clichés) and even ventures into the spiritual realm. He is concerned and passionate regarding his subject and can turn a clever phrase. Many current environmental books are all doom but Safina is optimistic in some instances and pragmatic in others. With a home base on the Long Island Sound, Safina takes readers throughout the world, even to Antartica, to see how native species are faring in this polluted and rapidly changing world. He remains upbeat despite frequent astonishingly bad reports. Nature is in need of an advocate, and Safina steps in to be that advocate...explaining the problems and contemplating solutions. What I really enjoyed was that he didn't dumb down his data and directives just to make the material easier....some of it is technical and difficult but he gives the reader credit for understanding. He makes these subjects conversational while still complex. A beautifully written book about some of the world's most pressing environmental challenges. Safina manages to make cautionary tales sound like poetry. Well worth your while. I've been sitting on this book for over a year, feeling guilty that I've not yet reviewed it. It's not that I dislike the book, or found it boring; to the contrary, it's because it's so rich and interesting a book that I found it difficult to do it justice. Part of the work is Safina's lyrical accountings of his life at Lazy Point, its seasons and its creatures, interspersed with his journeys to other parts of the world, such as Antarctica and remote Pacific islands, where he observes their environments and inhabitants. Interwoven with these natural and personal histories is his argument, which is complex and challenging to reduce down to a few lines in a review. But I'll give it a shot, because what he has to say is very important. His largest argument is that our societies' ways of understanding the world and our place in it are outdated and fail to work with the knowledge we've learned through science in the last century or so. As such, they are likely to encourage us in behaviors that are destructive, and make it hard for us to understand and perceive ways of living that are sustainable over the long run. Some of his critique is aimed at religious beliefs, but the bulk of his challenge is directed towards capitalism, particularly so-called "free market" capitalism. He argues that a social system aimed at maximizing benefits for a few while shunting the costs onto other people and the environment is not healthy, and cannot continue; the question then becomes how long will it take for us to realize this, and what will we put in its place. Much of his argument is spent showing the effects of this way of thinking, pretty much all of them bad, and it's hard to not be persuaded by his evidence. However, his argument is not simply a depressing jeremiad against a powerful and destructive system. He also takes care to show examples of alternatives, of places and approaches that work. One of his more important assertions is that nature is resilent, and that if given a chance to recover, it frequently will. Safina is not a purist; he's not looking to create a world in which nature is nothing but pristine wilderness. Rather, he hopes for a world of robust ecosystems, filled with species that are healthy rather than struggling at the brink of extinction, in which human beings can be active participants. He wants human beings to live in ways that recognize our interdependence with the world, and which reward us with lasting connections to each other and other species. That is, he argues, we need to shift from a mentality defined by increasing the quantity of consumption, to one in which development hinges on increasing the quality of our experiences. Put another way, he hopes that we can move from a culture focused on providing tons of cheap crap at the expense of our and the planet's health, to one in which we live simpler, but richer and healthier lives. This is an important book for me - one that helps to explain what is really at stake in our treatment of the earth on which we live. With hope and without being preachy, Carl Safina clearly explains the changes that he has seen (some good, most bad) and what the future may or may not hold. I highly recommend it. Heart-wrenching, eye-opening and exquisitely written. Safina has been compared to many of the giants in the natural history world, but he's a better writer than the lot of 'em. In this latest book, he waxes a bit more philosophical than he's done before. His philosophy fits my belief system like a glove, and his conclusions are breathtaking. One trembles to think that we are on the razor's edge, that our window to ameliorate our planet's distress is closing rapidly- and that if we don't do it, it will be done for us with a heartless finality that will brook no arguments. As we say where I live, "The mountain don't care if you live or die." "So I guess what I'm trying to say is that, though I'm a secular person and a scientist, I believe that our relationship with the living world must be mainly religious. But I don't mean theological. I mean religious in the sense of reverent, revolutionary, spiritual, and inspired. Reverent because the world is unique, thus holy. Revolutionary in making a break with the drift and downdraft of outdated, maladaptive modes of thought. Spiritual in seeking attainment of a higher realm of human being. Inspired in the aspiration to connect crucial truths with wider communities. Religious in precisely this way: connection: with a sense of purpose." "If there is a God, then all things natural are miraculous. If there's no God, then all things natural are miraculous. That's quite a coincidence, and ought to give people holding different beliefs a lot to talk about. People who see the world as God's and people who sense an accident of cosmic chemistry can both perceive the sacred. Let's not be afraid to say, to explain- and, if necessary, to rage- that we hold the uniqueness of this Earth sacred, that the whole living enterprise is sacred. And that what depletes the living enterprise always proves to be, even in purely practical terms, a mistake." I'm still reeling from Safina's descriptions of hunters who still (still!) kill ducks and toss them into the bushes because they are there for the sport (sport!) of duck hunting and have no interest in duck eating. I'm still encouraged by his reports of some of the species that have come back, once we humans gave them a little space and time. And I'm very, very frightened about what my grandchildren will have and hold. Long time ocean observer and naturalist writes a day-to-day account of the intricacies of nature. Safina is realistic about the state of our natural world, disheartened and yet able to dwell in the miracle of it all never the less. A title to be read slowly, attentive to his words and the knowlege he imparts.